It's a definite sign that it is officially summer because Sunset on the Square starts this weekend! 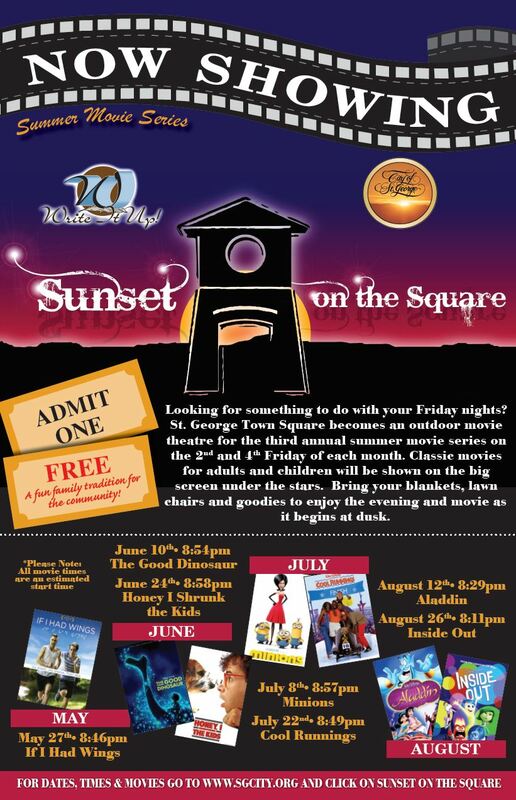 Sunset on the Square is a free movie night in St. George Town Square! Everyone is welcome! It is on the second and fourth Friday of each month and they start the movie at sunset (hence the name). I love going to these each summer. It is the perfect family night, date night or night out with friends. They usually have at least a couple food trucks or concession stands there that you can purchase food or snacks from. We got some Riggatti's pizza last time I went. Yum. If for some reason they don't have food trucks there you can go over to any of the restaurants on Main Street like One Hot Grill, Twenty Five Main, Riggatti's or Twisted Noodle just to name a few and get some food to go! This Friday they will be showing If I had Wings. I have never heard of this movie but I looked it up and it looks really inspiring.